Niftylift has held another Women in Engineering Day at its Milton Keynes headquarters and manufacturing plant. 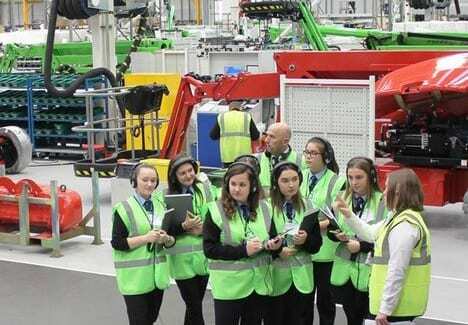 The Women in Engineering Day is aimed at female students in years 9, 10 and 11 from the local community and more than 60 students and teachers attended the event. Niftylift hosts the event every year or two to encourage women into engineering roles. The event offered the girls a unique opportunity to learn about the different career paths available within the field of engineering, while highlighting the fundamental role engineers play in society. The afternoon included tours of Niftylift’s manufacturing facility, engineering themed activities and talks from Niftylift’s female staff members. These women described their jobs to the aspiring engineers and told their personal stories of how they became engineers. The main point of the day is to encourage female students to take up engineering, and at the same time overcome a shortage of engineers in the UK. At GCSE level, there is little difference between the number of boys and girls taking Science, Technology, Engineering and Maths subjects, but this changes as they get older. The number of females taking science related subjects at A Level drops to around 30 percent, and then down to 16 percent at University. By the time they start work this falls further still, with only nine percent of the engineering workforce being female, with only six percent formally registered as engineers and technicians. Niftylift has held days like this on a regular basis over the past few years and works closely with local schools and colleges. While this effort is exemplary, it also serves its own self-interest as young imaginative minds come up with new ideas and concepts and it helps develop a pool of local talent. Other companies would do well to take a look at the programmes the company operates in order to help establish their own programmes for both male and female students. If all companies followed this example the industry would solve the current shortage of skilled technical staff.